The current exhibition at the BCA Center, "Ready. Fire! Aim.," is thoroughly engaging; every one of the half-dozen artists included contributes in an utterly distinct way to the curatorial theme. That is to say nothing of the parallel collection of works at the Hall Art Foundation in Reading, which this reviewer has not yet seen. In 2015, BCA curator DJ Hellerman, who has since moved on to the Everson Museum of Art in Syracuse, N.Y., devised a joint exhibit with BCA and the southern Vermont facility. The latter focuses, in part, on works owned by collectors Christine and Andrew Hall. Casual viewers, at least at the Burlington venue, may not have a clue what "Ready. Fire! Aim." is about. The proposed theme does not manifest itself obviously or consistently in all of these works. But, frankly, it hardly matters; these are artworks that stand on their own, requiring no thread to unify them with their neighbors. A brochure prepared for the exhibition includes an essay by Hellerman explaining the genesis of his idea. The show's title is derived from that of a 2008 business book by Michael Masterson, bearing the subtitle Zero to $100 Million in No Time Flat. So what does a guide to the "four stages of entrepreneurial growth" have to do with art? When a reporter once asked Andrew Hall how he decided which art to acquire, Hellerman recounts, the collector responded with "Ready, fire, aim." Or, as Hellerman deciphers it, "Prepare. Execute. Strategize." What that means, exactly, remains unelucidated. If this oblique insight into the mind of a collector laid the foundation for a dual exhibition, Hellerman says, last November's presidential election ultimately superseded it as an inspiration. Now, he writes, "This phrase has become a way to externalize the fear and uncertainty that accompanies the current political climate." The new administration, he adds, "favors shortsighted 'firing' over preparation, let alone strategy." That is something most of us can agree on. And the political context sheds light on Hellerman's assertion that the exhibition "straddles art and politics both as a collecting philosophy and a governing philosophy" — using the word "philosophy" liberally. Art and politics, after all, are not strange bedfellows and, in this case, might provide a fulcrum on which to balance meaning. While private collection may be an overarching motif of the show, the artworks at BCA do not belong to one; they were, according to Hellerman, created in response to the show's theme. And those responses, as noted, are delightfully diverse. The exhibition title could have been written for Matthew Peterson alone. His large-scale, black-and-white photographs are very nearly a literal manifestation of the words. After all, shooting involves aiming and firing. (One photo is even about a fire: "Burnt Down Church on Elmwood Ave.") Peterson underscores that functionality by describing his process, in an artist's statement, as impulsive and intuitive: "Images are taken without the consideration of composition." Later, he might crop them to create a "visual story line" for his self-published zine, Flatlander. The six images included here seem random, but what they have in common, as Hellerman notes, are "moments of tension and ambiguity." In blocking out background, Peterson eliminates frame of reference, forcing us to consider just the thing that has caught his eye. That might be a sandwich board reading "Most Everything Must Go!" or the close-up face of a man about to throw a dart (yes, he's aiming). Or it might be the backs of people sitting at a bus stop, the central figure a woman draped in what appears to be a long hijab. Peterson requires us to imagine our own stories about what we see, and, in examining our thought processes, we gain insight into his. Across BCA's front gallery, works by Timothy Horn deliver quite a disparate impression. Two large wall-hung sculptures from Horn's "Gorgonia" series are the opposite of impulsive. 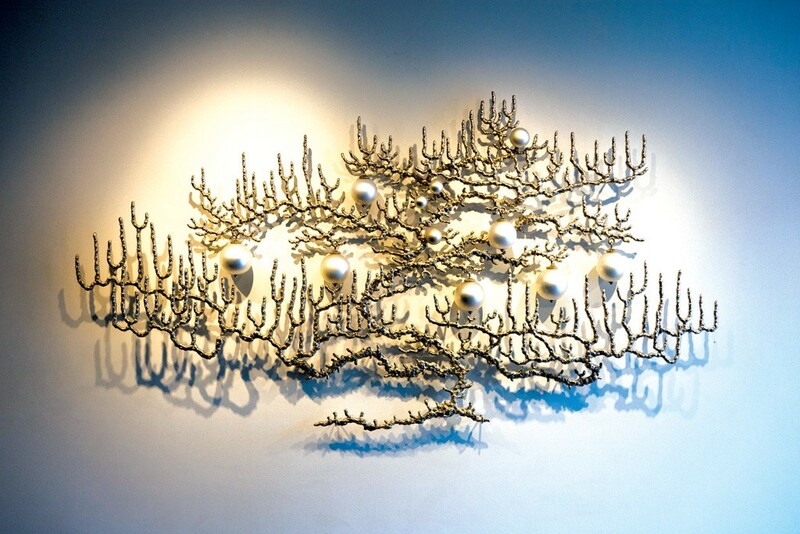 As the name suggests, the works resemble coral-like oceanic life forms, their tendrils seeming to float upward as if underwater. However, they're made of laboriously cut and assembled nickel-plated bronze. So "Gorgonia 9 (Fan Dance)," at 51 by 95 inches, and "Gorgonia 11 (Sarabande)," a sprawling 84 by 77 inches, are heavy. White blown-glass balls hang from each of these forms like bulbs on a Christmas tree. While stunningly beautiful, the sculptures evoke an over-the-top indulgence that is at odds with delicate sea life. As Hellerman puts it, they "link an era of opulence and wealth before its inevitable fall with natural beauty and ecological decline." 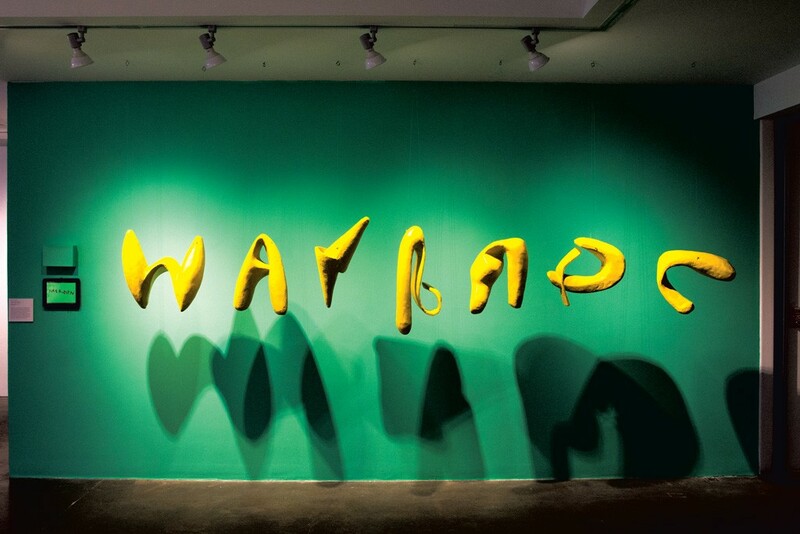 Sharing space in the front gallery, Nancy Dwyer turns clever wordplay into objects — bright-yellow puffy letters suspended before an aqua-hued wall. The first two are W and A, the rest too distorted for legibility. A printed explanation establishes that "Somewhere Between WANNABE/HAS BEEN" is based on a 30-second animation Dwyer created in 2002, in which the word WANNABE slowly morphs into HASBEEN. The artwork itself is torn between past and present, representing a culture of distraction and the difficulty of heeding that mindfulness mantra: Be here now. The back gallery pairs two artists who, again, differ greatly in medium, yet both draw from deep wells of sociopolitical, psychological and even literary insight. Long experience working in the mental health field provides inspiration to Peter Gallo. His assemblages, paintings on drawers and sutured, seemingly bloodied canvases might seem like the work of a naïve artist, but their allegorical richness suggests otherwise. Gallo's humble found materials are transformed by what Hellerman calls his "underlying observations about the fragility of the human condition and psyche." Like Dwyer, Mildred Beltré employs language in her works, though they remain two-dimensional. Here, three 38-by-50-inch pieces in walnut ink and colored pencil, plus a 27-by-33-inch digital print, borrow text from Zora Neale Hurston's 1928 book How It Feels to Be Colored Me and Kathryn Stockett's The Help (2009). The decades between those volumes did little to change the discourse of race and falsely founded human hierarchies. 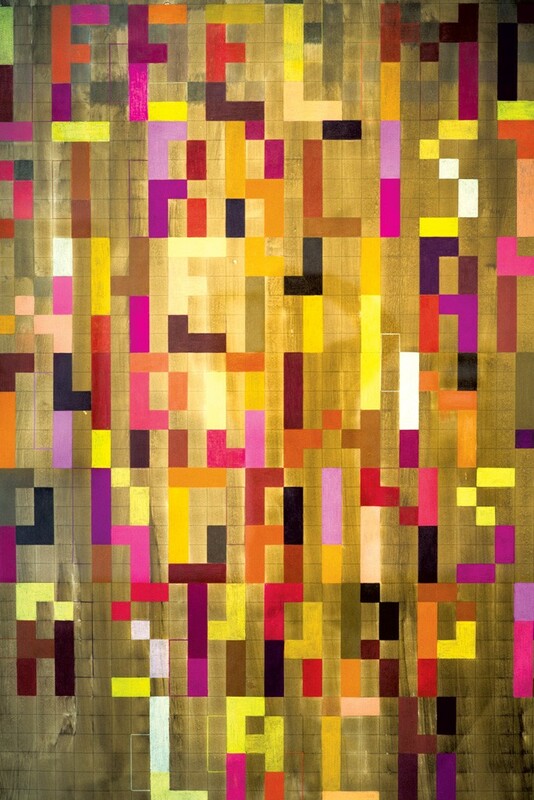 Beltré explores and abstracts words, inviting viewers to ferret out meaning from her mazelike geometric patterns. While pleasing to the eye, the drawings also provoke awareness of and questions about identity. A mixed-media installation by Jonathan Gitelson in the BCA Center's second-floor gallery concludes "Ready. Fire! Aim." The most chilling contribution to the exhibition, it addresses refuge, hiding and human survival. Viewers enter a dim room where two-dimensional framed pieces hang on two walls: a photograph of a Brattleboro home that was once part of the Underground Railroad, accompanied by diagrams of its hidden chamber; and, typewritten on two sheets of paper, "Prospectus and Guide to the Secret Annex, Anne Frank's Diary, 11/17/1942." On a third wall, a video projection of a red-lit tree flashes menacingly. The fourth wall holds a shelf of survivalist books. In one corner of the room, viewers are directed to open a door-like panel. Behind it, a long, narrow "safe room" is filled with basic necessities: cots, flashlights, packaged food, hot plate, games, toothbrushes, towels. Heartbreakingly, one small bed holds a child's stuffed animal. While Gitelson's references are historical, genocide, racial and ethnic targeting, and the exigencies of human safety are still with us. In this sad chamber, the exhibition's aim is true. The original print version of this article was headlined "Hitting the Mark"